Most cat owners dread giving their cat medication, but if your cat’s medication is in paste form, you may be in luck. Paste medications are quickly becoming the norm in nutritional supplements, hairball remedies and laxatives because they are much easier to give than a pill or liquid. A paste medication is basically a suspension that has been bound with a gel-like ingredient that prevents it from separating in the tube. This gel is sticky enough that it will stay where you put it until the cat swallows it, and taking advantage of the cat’s natural fastidiousness is often the easiest way to give the medication. There are, however, several options. Squeeze out the recommended dose onto your fingertip. Smear the paste onto one of the cat’s front paws, and leave it alone. It is often a good idea to use a little more than necessary in case some of it falls off. Watch the cat for the next few minutes to make sure it licks the medication off of its paw. 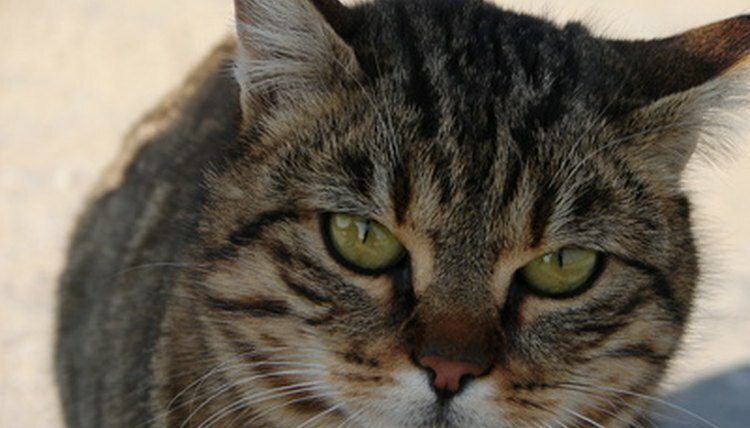 Cats hate to be dirty, and taking advantage of this fact may get the medication into your cat quite easily. Most cats will clean the paw until no trace of medication remains. Place a dab of the paste onto your cat’s nose. The cat will lick it off, and this will get it used to the taste. Mix the rest of the dose into some smelly canned food, and allow the cat to eat. If the cat licked the paste off of its nose, it will not taste it in the food. Observe to make sure the cat eats all of the food so he gets all of the medication. Some owners mix only a tablespoon or so of food with the medication to make sure it all gets eaten, then feed the rest of the meal afterward. Squeeze the recommended dose onto your fingertip. Grasp the cat’s head with your other hand, and use the hand with the paste to pry its mouth open. Hold the head around the back of the jaw, pinching the cat’s cheeks between its back teeth so it will not bite down. Smear the paste onto the roof of the cat’s mouth in one quick motion. Do not let go of the head until your finger is out of the mouth. The paste will stick to the roof of the cat’s mouth until it is swallowed. Squeeze the recommended dose into the back of a syringe, and replace the plunger. Depress the plunger until the paste is ready to come out of the tip. Wrap your cat in a large, thick towel, making sure all limbs are tightly bound, with only the head sticking out. Stick the tip of the syringe in the space between the cat’s molars and pre-molars, and squirt a little bit of paste into the mouth. Allow the cat to swallow. Repeat the squirt-and-swallow process until the entire dose has been given. Do not force the entire dose at once, or it could cause the cat to choke. It helps to have someone nearby to lend an extra set of hands. Do not yell at the cat; instead, reward it afterward. Cats respond much better to praise than discipline.